Alex Raymond, it quickly developed an audience far surpassing that of the earlier strip. Raymond's beautifully rendered Sunday pages attracted far more loyal readers than pulp writer Don Moore's rather contrived and unconvincing adventure stories could have without him. The series opened on January 7, 1934, a full page (including its topper, Jungle Jim), and action-packed from the very start. Flash, a world-famous polo player, parachuted uninjured from an aircraft that had just been wrecked by a falling meteor. He and the beautiful Dale Arden, whom he'd grabbed on the way out, landed right where Dr. Hans Zarkoff was about to rocket into space to head off the runaway planet Mongo, which was about to collide with Earth. If that isn't improbable enough, the three immediately became embroiled in the affairs of Mongo's inhabitants — particularly those of its insidious warlord, Ming — and more-or-less shrugged off the threat to their own planet. But Mongo's inhabitants were able to provide years of adventures, and Raymond's art was among the most highly-regarded — and most imitated — in all of comics. When Raymond joined the Army, in 1944, magazine illustrator Austin Briggs, who had drawn the Flash Gordon daily strip since its beginning in 1940, took over, using a similar style. Raymond didn't return to the strip after the war (he busied himself with a new one, Rip Kirby), so Briggs continued until 1948. Then comic book veteran Emanuel "Mac" Raboy, whose credits include long stints on The Green Lama and Captain Marvel Jr., took over. Although Raymond is most closely associated with Flash Gordon in the minds of comics aficionados, the man who devoted more of his professional life to the strip than any other was Dan Barry. 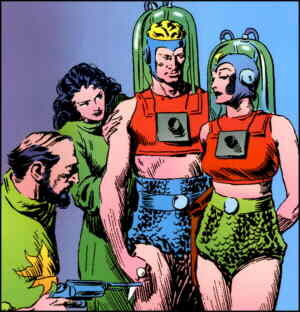 In 1951, the Flash Gordon daily strip, which had been canceled in 1944, was revived, and Barry was its artist. Through a succession of writers, including Mad magazine founding editor Harvey Kurtzman and science fiction author Harry Harrison — but mostly working with his own scripts — Barry remained with the strip nearly four decades. When Raboy died, in 1967, Barry took over the Sunday strip as well. In comic books, Flash starred in an occasional release from Harvey or Dell Comics from the 1940s through the '60s. In 1966, King Features started a comics line of its own, and Flash started appearing regularly alongside such stalwarts as Beetle Bailey and Blondie. The series was initially drawn by Al Williamson, a comics veteran whose major influences include Alex Raymond. The venture proved unsuccessful, however, and in 1969 the line was taken over by Charlton Comics. That series lasted only until 1970. Between 1978 and '82, Flash appeared in a comic book series from Gold Key. DC did a brief one in 1988 and Marvel in 1995 — and in the latter, Al Williamson reprised his role as artist. Buster Crabbe played Flash Gordon in no less than three movie serials beween 1936 and 1940. Flash appeared on radio during the 1930s and in a series of novels during the '70s. In 1954 he had a TV series, which ran 38 episodes, with Steve Holland in the title role. A feature film, released in 1980, starred Sam Jones (who also portrayed The Spirit on the big screen). Flash appeared in animated form on TV, from 1979-81, with a feature-length episode in 1982. By far, his most bizarre media treatment occurred in 1987, when he teamed up with his fellow King Features heroes, The Phantom and Mandrake the Magician, in a Saturday morning cartoon titled Defenders of the Earth. Sci-Fi Channel aired a new live-action series starting August 10, 2007, with Eric Johnson (Whitney Fordman in Smallville) as Flash, Gina Holden (who appeared in the 2005 Fantastic Four movie) as Dale and Jody Racicot (also seen in Witchblade) as Dr. Zarkov. In 1995, when the U.S. Postal Service honored 20 "Comic Strip Classics" with commemorative stamps, Flash Gordon, along with such luminaries as Li'l Abner, Gasoline Alley and Alley Oop, was among those chosen. Dan Barry retired in 1990, triggering a succession of different artists with different styles. Three years later, the daily strip was once again canceled. Today, Flash Gordon survives only as a Sunday strip, in the hands of writer/artist Jim Keefe — who cites both Alex Raymond and Al Williamson among his artistic influences. But faint echoes of its glory days can still be seen, throughout the realm of comics. Even today, Alex Raymond has his imitators. Text ©2000-07 Donald D. Markstein. Art © King Features Syndicate.